The placement of the L.E.D.s on the Quasar Lighting System™ plays an essential role in the over-all performance of the Lighting System. Rather than having only one or two bulbs lighting your work area, the Quasar LS utilizes multiple light sources located in an array around your field of vision. The result is an even, bright field of light that is focused directly in your line of sight. 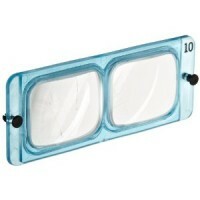 It is similar to having several lights focused directly onto your work area from different angles. The entire Lighting System is also light weight. 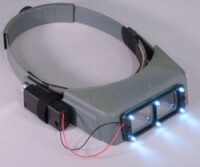 Only weighing 25grams without batteries and 57grams with batteries, the lighting system can be added to your visor without noticing much difference. Rather than clipping a light to the top of the visor, Novacon has embedded six super-bright white LEDs into a new frame that overlays the existing lens on your OptiVISOR. These six LEDs provide bright illumination within the focal range of the lenses. The illumination diffuses rather quickly beyond a few feet, which is just fine since the lenses are not optimized for that distance anyway. Installation is literally a snap. Unscrew the existing lens mounting screws from the OptiVISOR, replace them with snap pins that run through the light frame, lens plate, and finally through the OptiVISOR itself. Two snaps and the new assembly is in place. 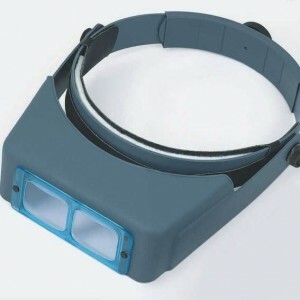 Next, the battery box is held in place on the side of the OptiVISOR using a Velcro strap. Like the mounting pins, this battery box installs and is removed in seconds. The unit is powered by a pair of AA Energizer batteries. The instructions that accompany the unit show that non-rechargeable AA batteries have the best performance for light brightness and duration. Energizers tested out the best. The worst performers are the rechargeable batteries as they are only 1.2 volts versus the standard battery rating of 1.5 volts. 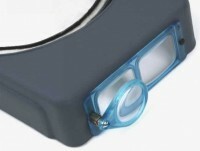 The OptiLOUPE is an attachable lens that adds the additional power of an Eye Loupe to the OptiVISOR. Easily attaches to either eye of any OptiVISOR.